In this exotically fun, family board game, players created twisting pathways for gathering gems and moving them along to an exit. Not every exit may belong to just one player; building occassional alliances with your opponents could be the key to ultimate success. Simple rules let everyone be a part of this intriguing adventure. Our group really liked this as a quick abstract that pretty much everyone can play. The randomness of the tiles allows more experienced players to have fun with less. It’s not terribly deep, but delivers exactly the game experience that the box describes. Its harder to find (for me anyway) than Tsuro, but well worth it. The components are good, but not amazingly over the top. The rules are very clear and well written, always a nice bonus. The hex board adds a new level of play compared to similar games in this category. 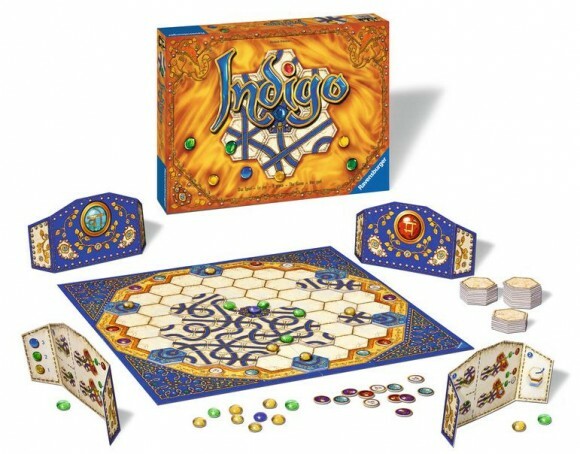 Add a Review for "Indigo"